Lift trucks are more commonly referred to as Forklifts. Forklifts or Lift Trucks have a vertical mast, also referred to as an upright mast. The mast is the vertical assembly on the front of the forklift that does the work of raising, lowering, and tilting the load. Lift Truck Powered Mobile Equipment (PME) training courses provided by Western Canada Fire & First Aid follow the guidelines and principles outlined in Part 19 of the Alberta Occupational Health and Safety Code as well as those established by the Canadian Standards Association and recommendations by the Canadian Centre for Occupational Health and Safety (CCOHS). The PME programs cover the basic knowledge and skill requirements for the safe operation of the equipment and their attachments. Training is offered at Western Canada Fire & First Aid’s training center in Edmonton, Alberta or onsite at your location with a minimum number of students. Courses can be customized to meet the requirements necessary to operate specific equipment and the different classifications of lift trucks. Please contact us for more details. The skilled lift truck operator is one who has at least 100 hours of recent experience operating a lift truck. This course is intended for experienced operators requiring certification in order to meet their legislative requirements. The focus of the program is to ensure the operator understands the basic knowledge and skills necessary to operate the lift truck in a safe manner. Western Canada Fire & First Aid considers a new operator as one who does not have at least 100 hours of recent experience operating a lift truck. This course is intended to give a new operator the basic knowledge and skills necessary to operate the lift truck in a safe manner. In addition to the theory portion, this course offers approximately 4 hours of practical experience using the lift truck. It prepares the new operator to successfully complete the requirements necessary to be certified as a lift truck operator. A Variable Reach Lift Truck (VRLT) is sometimes referred to as a Telescopic Handler or Zoom Boom. 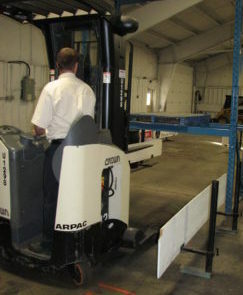 Although a VRLT is technically a lift truck (forklift), this machine is covered in a separate course. 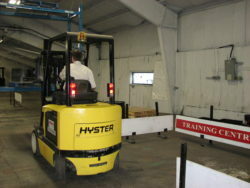 See Variable Reach Lift Truck courses for more information.